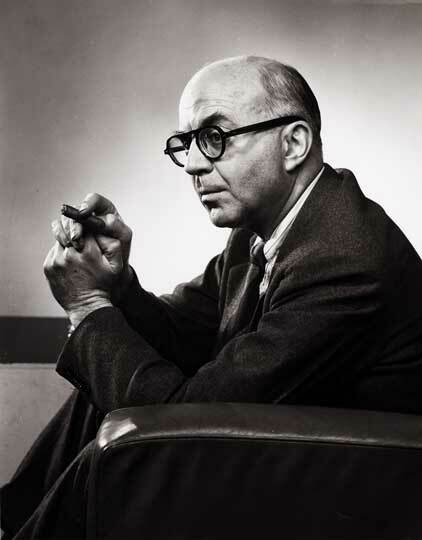 John Roderigo Dos Passos (January 14, 1896 – September 28, 1970) was an American novelist, most notable for his U.S.A. trilogy, written in experimental ‘non-linear’ form, blending elements of biography and news reports to paint a landscape of early 20th-century American culture. Published through the 1930’s, it reflected the death of idealism and a pessimistic view of national politics. His U.S.A. trilogy, which consists of the novels The 42nd Parallel (1930), 1919 (1932), and The Big Money (1936), was ranked by the Modern Library in 1998 as 23rd of the 100 best English-language novels of the 20th century. 14" x 11" original silver print with Halsman's stamp on the reverse. Dated 1947.